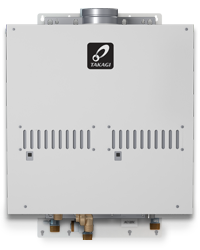 The T-M50 is a fully modulating, gas fired, tankless water heater perfect for heavy-duty commercial applications. The T-M50 can produce enough hot water for six bathrooms in warmer climates. ASME certified.